Drops from Grand Magus Telestra on heroic mode. The possibilities for this helm as an entry-level tank are better than what first meets the eye. 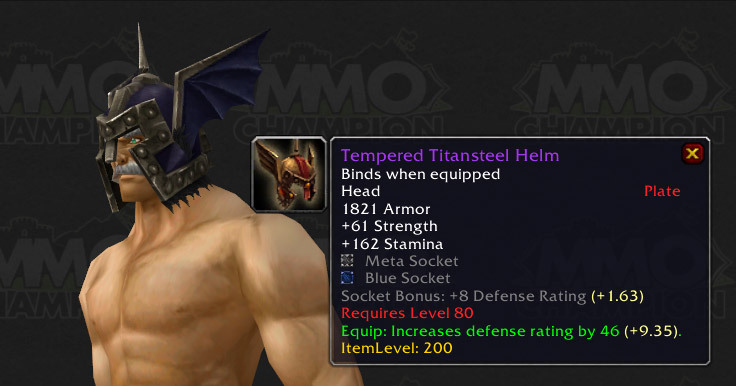 When compared to Tempered Titansteel Helm (another great entry-level helm), here's what you get. Basically, you lose a bit of HP and a negligible amount of def for 1.32% dodge AND get the benefits of a meta. An acceptable substitute (if not the better choice), if you ask me. The Tempered Titansteel Helm is being updated in a coming patch, which should put aside any of the above arguments. It is having a blue socket and a meta socket added with a socket bonus of +8 defense. None of the other stats have changed. Since you can then ignore sockets and their bonuses, since they are the same, the comparison is as follows. You also get to have wings on the side of your head. Given the diminishing returns of avoidance stats, the Titansteel helm will have a lot of longevity to it simply because it is so stam heavy.